Give your kitchen a much needed face lift. Fresh painted kitchen cabinets always seem to freshen up a boring kitchen. If you are looking for a way to add life and excitement to your kitchen, perking up the kitchen cabinets just may do the trick. Being able to do it yourself will save you money and the pressure of finding a professional to do it for you. This task will require some muscle and patience, but the outcome will be well worth all of the sweat and energy. Here is how to paint kitchen cabinets that will make your kitchen feel bright and updated. After you take your cabinets apart removing all hardware and screws, the wood surface need to be cleaned with the TSP Substitute or degreaser. This will get off all of the old grease, grime, and finger prints from years of wear and tear. Wipe down all of the surfaces that you are going to paint. Keep up with your hardware and make a note as to which piece goes where, if you are keeping the old hardware. If you will be using new hardware, you will need to fill in the old holes with wood putty. Sand out any dings out of the doors, and sand it going with the grain, so that you will get a smooth finish. Now you can paint the primer on the cabinet doors starting with the center panel. First stroke against the grain then add the second coat going with the grain. Let one side dry completely before you turn it over. Prime the cabinet boxes as well. Make sure that you let ever door dry flat so that there won’t be any streaks and drips forming. After the primer has dried, now use your grit sander to sand it smooth all over. Use your sanding sponge to get into the grooves. When everything looks smooth as you desire it to be, vacuum the sand away and wipe the doors down. Make sure that there is no grain of sand on the cabinets to get into the paint. Now that you have prepared the cabinets, it is time to paint them. Give them two coats of paint starting with the center panel and work your way out. Let them dry completely before you add the second coat. If you want an extra smooth finish use an airless paint sprayer. 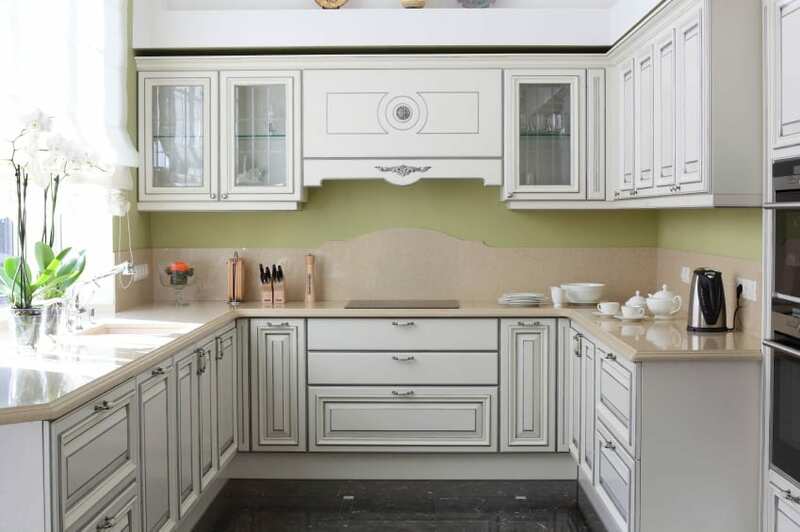 For more intricate details on how to paint kitchen cabinets go here.